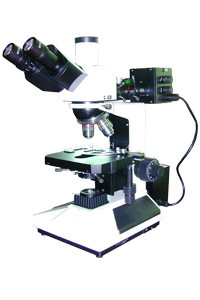 L2020 reflected and transmitted metallurgical microscope is equipped with reflected and transmitted illuminator system, plan achromatic objectives with long working distance (no cover glass), wide field eyepieces and set polarizer device in trinocular. They can obtain clean image in the wide visual field, can be broadly applied in mine, colleges and scientific research department to observe internal configuration of material. * Utilize reflected &transmitted light mix illumination; you can descry the special effect in some object.